The Towers is a large family-owned hotel where a warm, friendly welcome, excellent facilities and the highest standards of service and cleanliness ensure that your stay is a most pleasant one. Our award winning Tower in the grounds of the hotel is a unique and historic landmark. 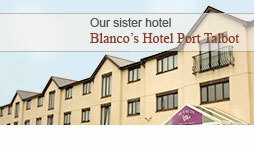 The Tower itself has three Luxury Bedroom Suites, each enjoying great views across Swansea Bay. We are very proud to be the hotel of choice for top-flight Rugby, Football and other sports teams visiting and competing in and around the Swansea area. Offering first-rate facilities for business travellers, conference organisers, those getting married or looking for a place to eat and drink in comfort, The Towers Hotel Swansea is also a great base for a wonderful family holiday. The beautiful Gower Peninsula is only 30 minute's drive away and the historic city of Swansea is on the doorstep. We are only a short drive from Cardiff and the spectacular Pembrokeshire coast.